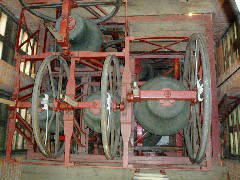 Bells have been rung at St Michael's since 1895. The church lies on a hill on the A30 as it runs through Camberley. The area was originally known as Yorktown but became merged into Camberley. The name Yorktown however lives on still as the Bell Ringers of St Michael's are still known as the "Yorktown Bell Ringers" which sometimes causes more than a little confusion for locals and visitors alike! We ring on Sunday mornings and for special occasions such as weddings. We practice on Wednesday nights and are always pleased to welcome both visiting ringers and people wishing to learn. The tower currently has 16 members and around 5 visitors who regularly turn up on practice nights. On practice nights, we generally ring a mixture of rounds, call changes and methods. The emphasis is always on having fun and getting everyone involved. Methods can range from Plain Bob and Grandsire doubles to Stedman triples and Cambridge. On a good night we might even chance a surprise method. Practice night: Wed 8-9:30pm & then afterwards at a local hostelry! Visitors and learners are always assured a warm welcome! 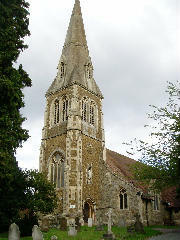 Although the church itself dates from 1851 the church spire, now a landmark across Camberley, was not added until 1891. It was built in memory of Freda Middleton, daughter of Revd Middleton. The 8 bells, cast by Warner & Son and hung on a wodden oak frame, were first rung in 1895. They were rehung in 1936 on a more solid metal frame. The bells were originally rung from the ground floor but a ringing chamber was added in 1971 which allows shorter ropes and easier ringing. The ringing chamber is a little unusual as it is open to the church which allows the congregation to "see" the ringers in action. There are nearly 6000 churches in England and Wales where you can ring. It's a hobby unique to the British Isles with very few "Change-ringing" towers elsewhere in the world. Each bell, swinging at speed through a complete circle, is controlled by its ringer and guided among the other bells in rhythmic sequence to produce that unique sound familiar to English towns and villages. All bell towers need a regular supply of recruits to increase their numbers and to balance losses through members moving away to college, university or other parts of the country and we are no exception! Almost anyone can, in time, learn the art of bellringing, and we are willing to teach anyone who is interested, however old or young. We have regular social events including Beer & Skittles evenings, BBQ's, Tower Dinners and days out to other towers in the area. 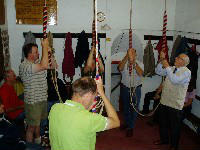 Ringing is all about teamwork and is a tremendous amount of fun. You'll need a sense of humour as well as a little patience and enthusiasm. You can take the hobby as far as you like, you'll make a whole new circle of friends and will always be made welcome in any of the 6000 church bell towers across Surrey and beyond. Interested in having fun and learning a new hobby? Please contact us as above.